We are very sad to pass along the news that Jessica died 8/23/10. She was greatly loved and will be missed by all of us. We will try to find Jack a new bunny friend if he's lonely. Flemish Giants often don't live as long as the smaller rabbits, and Jessica was about 7 years old. Rest in peace sweet girl. Hi. Yes, you are seeing what you think you are seeing. My name is Jessica. 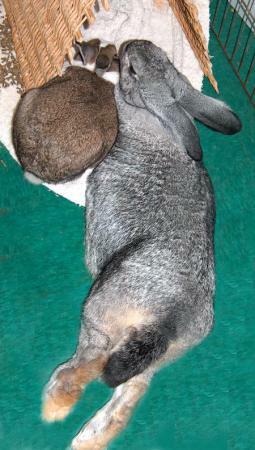 I am a VERY LARGE, Flemish Giant girl and my hus-bun is Jack, a gorgeous, neutered, Dutch boy. While we may be an odd couple in size, we are a perfect fit in how much we love each other! To be honest, we are surprised to find ourselves in rescue and in need of a forever home. Our humans moved out west from the East Coast with us and then surrendered us to a local animal shelter when they had a new baby and got busy with life. So here we are, on our own and looking for a great place with people to love us and help us feel welcomed and secure. Flemish Giants like me (I am about 13 pounds of pure bunny love and opinions) need to be with people who understand the care and handling of a BIG bunny. I really prefer to be petted on the ground and just adore my hus-bun Jack---he's the boss in our relationship. By the way...did you check out his bright blue eyes? Wow, what a looker! We are still settling in at rescue, but would LOVE to find a home where we can be mostly free range safely indoors. Looking for a ready made bunny family? That's us. You won't be sorry. Oh, one last thing...SaveABunny is still seeking confirmation of my spay surgery, so we'll keep you posted. Don't let that stop you from meeting us though! Please visit us soon. Look below at how cute Jack is! And of course, I am pretty amazing looking, if I say so myself!